.You won't regret seeing the egrets in Long Key State Park and here's a fact that you learn when you travel the Golden Orb Nature Trail. In 1886 Egret feathers were so valued for use in women's hats that they sold for twice the price of gold. If you take the over two mile Long Key Bridge to Conch Key you will see all manner of exotic birds competing with the local fishermen who wheel their wagons of bait and tackle to their favorite perches. Looking out on the ocean side, it's a Darwinian Olympics with birds swooping down to nail their prey just as anglers cast their lines, their faces lighting up as they reel in a catch. Leaving the village of Islamorada, the sign reads "catch you later." After you cross Grassy Key, one of the 1700 that you may never have heard of, you will come to the Dolphin Research Center, where you can also watch and learn about sea lions. Here is a typical morning at the DRC, 9:30 Play With Dolphins, 11:30 Manatee session, 12:30 Dolphin Encounter. Remember Flipper? Many of the stars of the l963 movie were dolphins trained by Milton Santini the fisherman who first brought dolphins to Grassy Key and whose training methods would pave the way for the DRC. 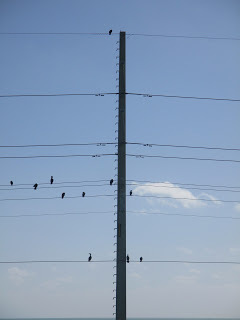 Was Leonard Cohen thinking about the Keys when he wrote "Bird on a Wire?" As you travel south on Route 1 passing little islets with names like Fiesta and Duck and witness the daily feast of nature, you can't help humming the notes of the song to yourself.